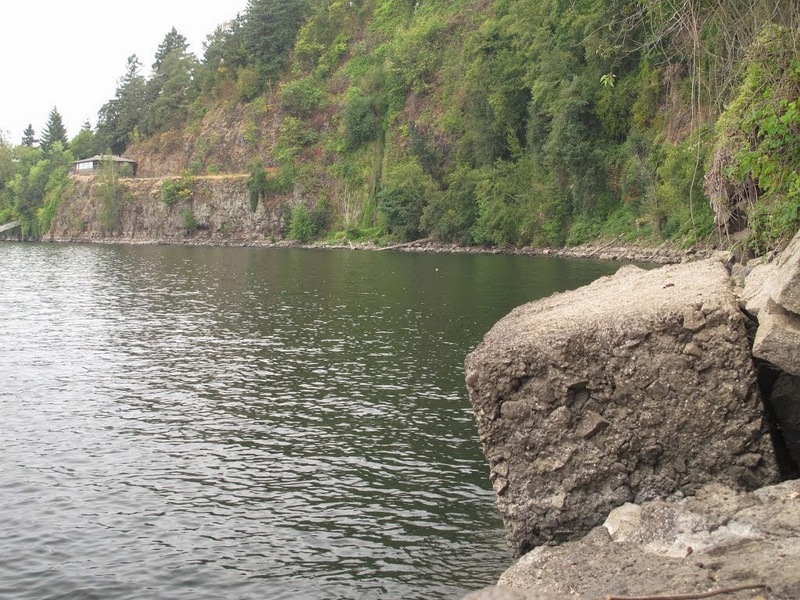 Elk Rock: a 260 foot rock bluff overlooking the Willamette River. There is an island on the other side of the river (Milwaukie) called Elk Rock Island. Initially, Elk Rock proved to be a barrier in the path of the railway. The first solution was trestle work that skirted the rock. After that, a tunnel proved to be a better answer. 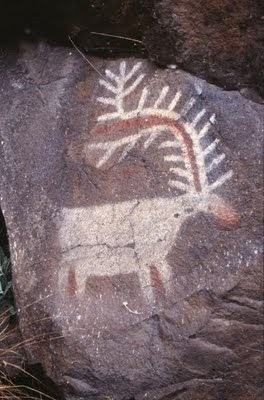 Elk Rock is named after the tradition of the local Indian tribes who would harvest elk by herding them off the rock cliff and retrieving them from the river below. 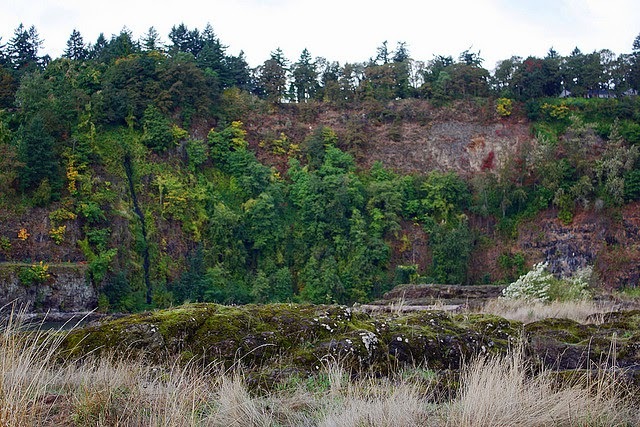 Both the island and Elk Rock are thought to be formed from an ancient volcano and represents exposed 40 million year old rock, thought to be the oldest exposed rock in the Portland area. Geologists call the local rock formation the Waverly Heights Basalt formation. The Elk Rock Trestle was a long wooden railroad trestle built along the cliffs of the Willamette River. 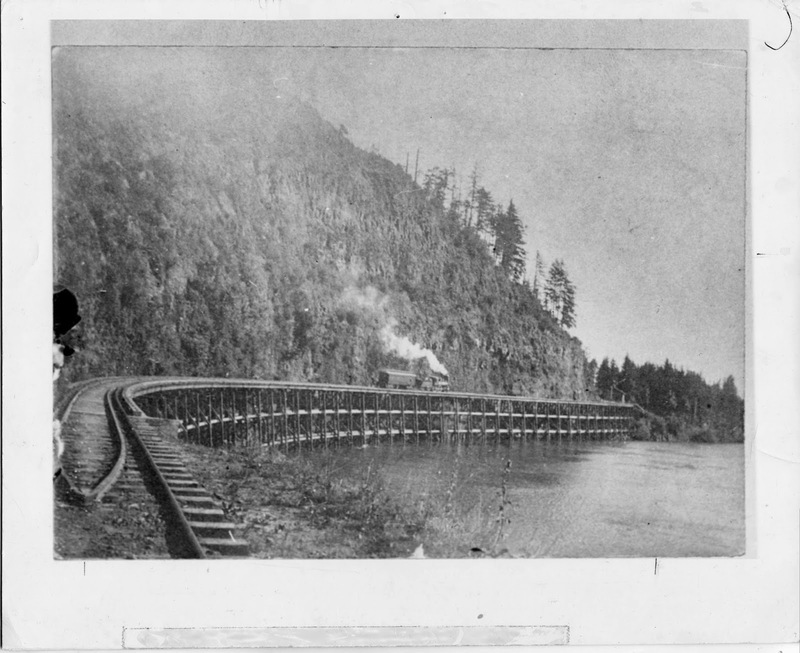 The rail line was used to travel between Portland and Lake Oswego (then known as Oswego). 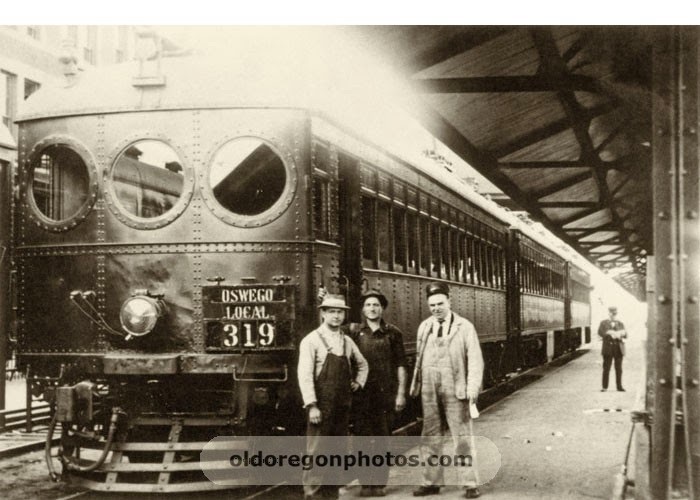 Built in 1887 by the Portland and Willamette Valley Railroad, it carried passengers by steam locomotive from Union Station in Portland thru Lake Oswego, Tualatin, Sherwood and Newberg. It also carried freight between Portland and southern locations. 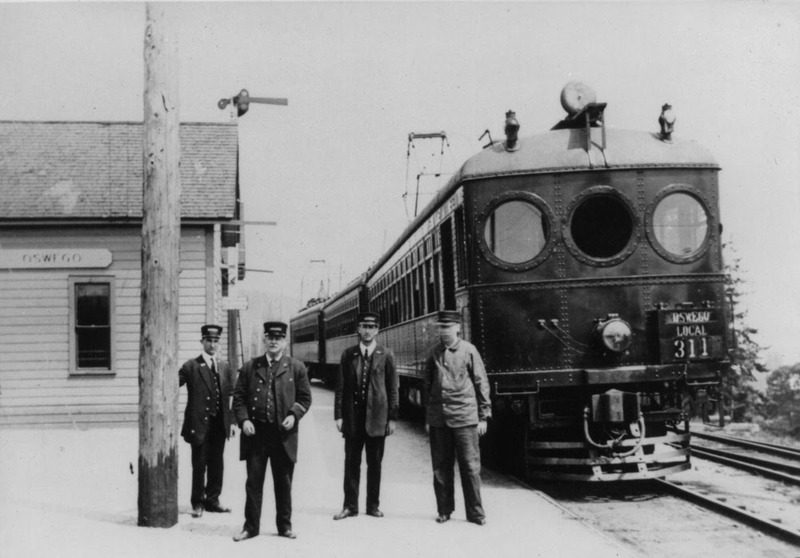 In 1914, the railway was electrified and Portland's "Red Electric" interurban train system was born. Navigating the trestle was a bit unnerving due to the height and its curves. If that wasn't enough, the vibration of the train sometimes loosened rocks from the adjacent cliff, occasionally showering the tops of the cars with rocks and gravel. One can imagine being a passenger crossing the high, curved trestle in the winter and having large rocks bounce off the cars at the same time. For these reasons, reluctant engineers slowed the trains to 10 mph when traversing the trestle. In the final years of the trestle, a watchman would monitor the conditions of the trestle and give the train the "all clear" signal to cross. The hazardous trestle was replaced by a tunnel in 1921. 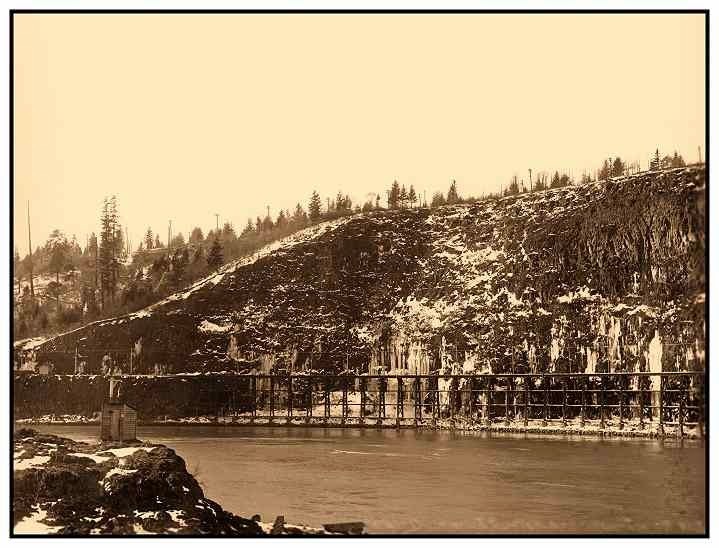 The original ER trestle was 1050 feet in length and 50 feet high. It was constructed and placed in service in the winter of 1887. It was considered quite an engineering feat at the time. Upon completion, the trestle provided the "missing link" between the railway north to Portland and south of Lake Oswego to the Willamette Valley. Before the trestle was built, people traveled the 1.5 mile breach to Oswego by primitive roads and a steamboat named "Traveller". The steamboat provided through service from Jefferson Street in Portland to the south end of the trestle via a landing. the end of the decade. The presence of the automobile, construction of roads and expanding bus lines spelled the end of the Red Electric train service. governments purchased the Willamette Shore Line right of way for future transit use. Shore Trolley during the spring, summer, and fall. Enjoy the following before and after pictures! Pictured above is the trestle clinging to Elk Rock on a snowy day in 1916. 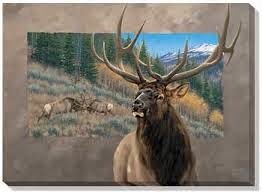 Pictured below is Elk Rock today. The steel topped "Red Electric" trains sturdy construction came in handy when fending off rocks while crossing the trestle. 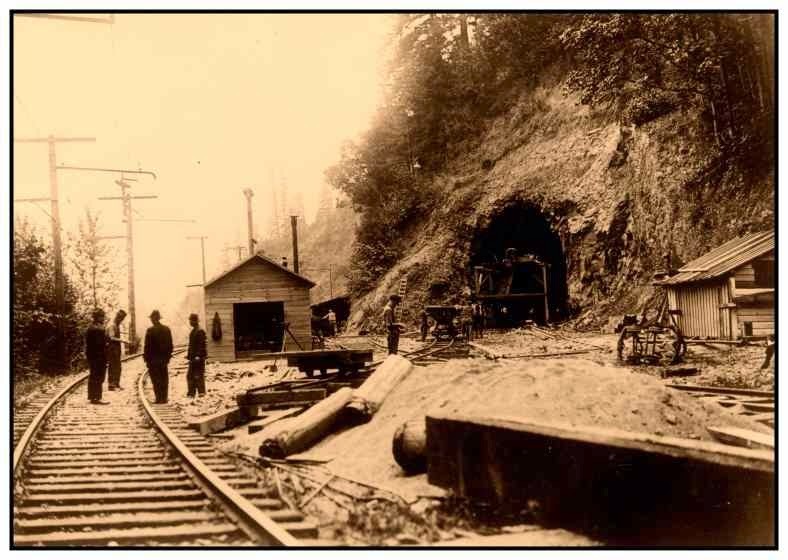 The Elk Rock Tunnel opened in 1921. Photo taken shows the north portal of the tunnel. The trestle (to the left and in the distance) caused the Southern Pacific considerable anxiety as rocks frequently rolled on top of the cars. 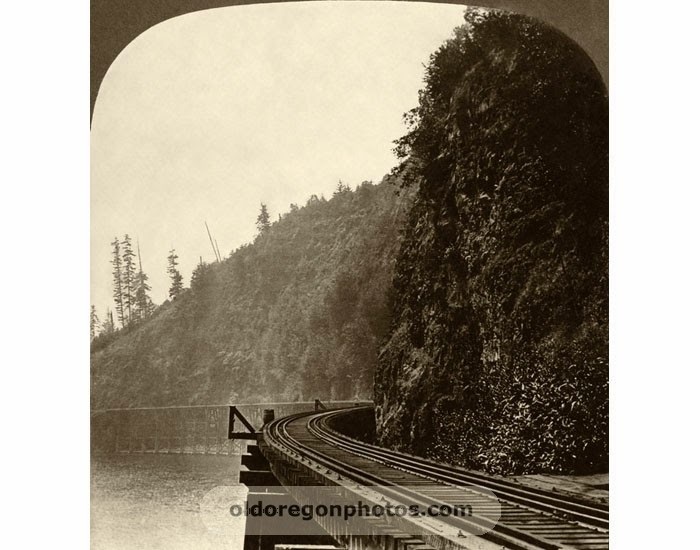 The original narrow gauge line was built from Dundee to Oswego (Elk Rock) and ferry service was used to complete the journey into Portland (Jefferson Street Dock ). The sign in middle reads: YARD LIMIT ONE MILE. Sign in distance reads: SLOW. 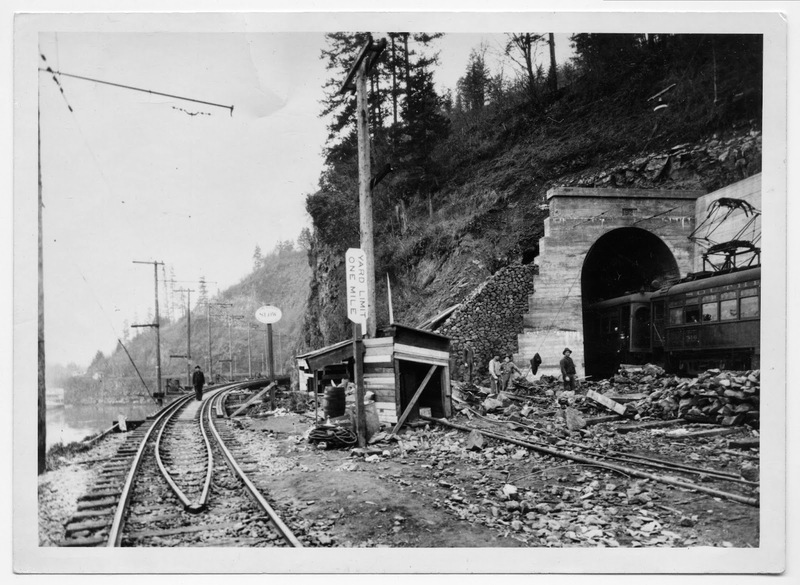 The Elk Rock Tunnel was completed on Dec 5, 1921 at a cost of $350,000. The tunnel is a 1/4 mile long. It is 23 and 1/2 feet tall and 18 feet wide. During the construction period of Jun 1 1921 thru Dec 10, 1921 over 100 workers were employed in shifts 24 hrs/day. Before the trestle was built, thru traffic was maintained by Steam Boat. I visited the Elk Rock tunnel on Mar 30 2014 and took the photo above. The one thing I noticed about the tunnel was how tall it was. I now realize the added ceiling height was made for the overhead electrical carriage (pantograph) and wires. 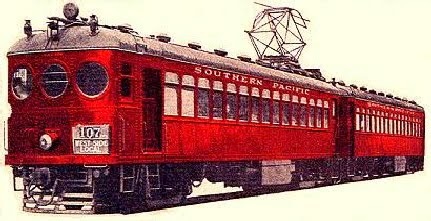 The Red Electric train car carried both passengers to and from Portland south to Dallas as well as mail. Oregon and California Railroad Co. 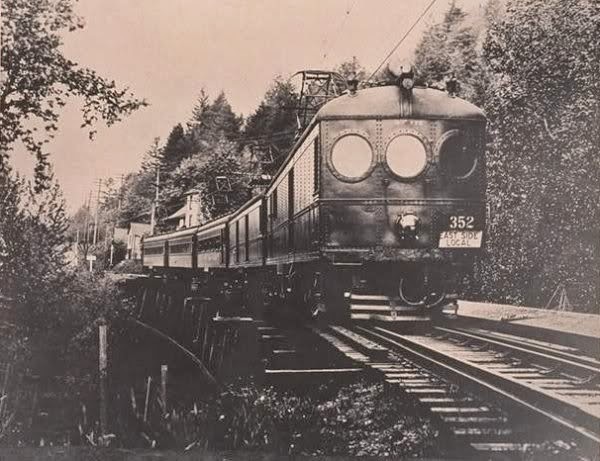 The Red Electric was an interurban passenger train service operated by the Southern Pacific Railroad in the Willamette Valley of the U.S. state of Oregon from 1914 to 1929. The service got its name from the bright red color of its cars. 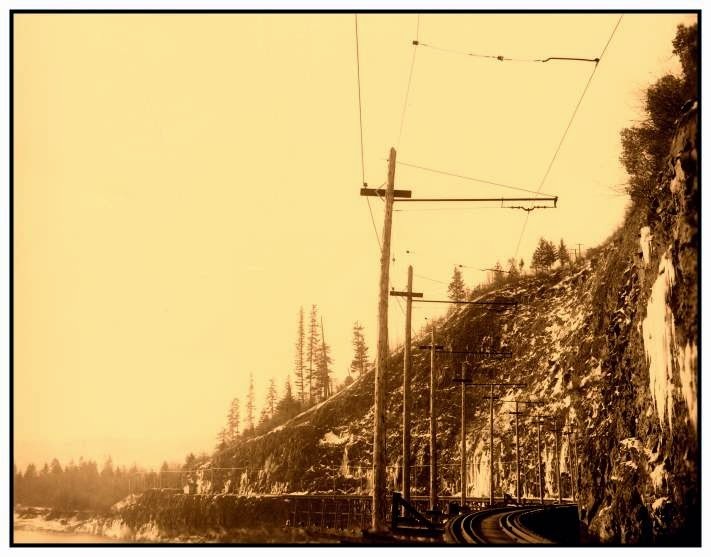 Despite its short history, among West Coast interurbans it was unique, and it was considered the finest such system in the Pacific Northwest. It was the only major electric interurban railroad converted from steam to electric passenger use. It was also one of few systems using all-steel equipment, and one of the largest 1500-volt systems in the country. In the years leading up to tunnel construction, the Southern Pacific had considered different solutions to the dangerous trestle. Re-routing the railroad, a fill in the river, a timber shed that would shield the trestle from falling rocks, a 3-span bridge, concretingthe face of the Elk Rock cliff, steel cables with wire mesh netting, etc., but the tunnel was adopted in favor of it's low maintenance cost.